Riverside has a growing collection of 2 pc set up boxes. 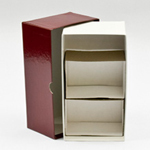 These pre-assembled rigid set up boxes are available in many sizes, for business cards, letterhead and gifts. Our Garnet Wine boxes will compliment the best of wines and spirits. We have select sizes of rigid set up gift boxes in 29 vibrant colors. If you don't see what you are looking for, call us and we'll quote any custom size and custom wrap. NEWEST and GREATEST: Gift Card Boxes. Enclosed your Gift cards in these stunningly beautiful boxes. Rigid Set Up boxes are the ideal choice for many products. Paper Set Up boxes are very durable and will not collapse. Set up boxes are made from a heavy 35 pt. paperboard. Other calipers of paperboard are also available. To add strength we can wrap each box with a paper of your choice. Paper wraps can also be printed with your logo or your design. The choices in paper wraps are endless. Glossy paper, foil paper, embossed paper and matt paper wraps are just a few of the choices for wrapping a rigid set up box. Normally there is no tooling cost associated with a simple set up box. Tooling charges come into the equation when you need a die cut window or design. If you need a set up box that is as small as a 1x1x1” or as large as 30x30x12”, give us a call. Setup boxes are usually two-pieces that are fully telescoping or have a shorter lid (semi telescoping). Custom rigid set-up boxes have lower minimums as compared to folding chipboard boxes and can be wrapped in many different colors. These exterior wraps can be printed or debossed hot stamp giving you an exception package. Raised Hot stamping on pre-assembled boxes is also available. We can custom make inserts to hold your product firmly in place in the set up box. Try our soft touch finish for a very luxurious velvety feel that resists finger smudges. RPC can do acetate widows on set up boxes for product viewing. Rigid set up boxes are the high end packaging product that allows you to design a box just right for your product. Rigid Set Up boxes, 2 pc set up cartons, Stationery box, letterhead box, business card boxes, set up gift boxes, rigid set up gift boxes, gift card boxes, colored pre-assembled boxes, orthodontic storage boxes, wind boxes.